This article is about the Polish chief of state. For other uses, see Pilsudski (disambiguation). Height 1.75 m (5.74 ft). 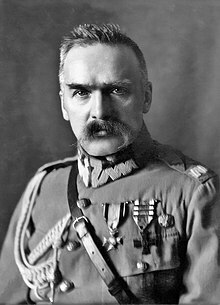 Józef Klemens Piłsudski[a], (Polish: [ˈjuzɛf ˈklɛmɛns pʲiwˈsutskʲi] ( listen); 5 December 1867 – 12 May 1935) was a Polish statesman who served as the Chief of State (1918–22) and First Marshal of Poland (from 1920). He was considered the de facto leader (1926–35) of the Second Polish Republic as the Minister of Military Affairs. From World War I he had great power in Polish politics and was a distinguished figure on the international scene. He is viewed as a father of the Second Polish Republic re-established in 1918, 123 years after the 1795 Partitions of Poland by Austria, Prussia and Russia. Deeming himself a descendant of the culture and traditions of the Polish–Lithuanian Commonwealth, Piłsudski believed in a multi-ethnic Poland—"a home of nations" including indigenous ethnic and religious minorities that he hoped would establish a robust union with the independent states of Lithuania and Ukraine. His principal political antagonist, Roman Dmowski, leader of the National Democrat party, by contrast, called for a Poland limited to the pre-Partitions Polish Crown and based mainly on a homogeneous ethnically Polish population and Roman Catholic identity. Early in his political career, Piłsudski became a leader of the Polish Socialist Party. Concluding that Poland's independence would have to be won militarily, he formed the Polish Legions. In 1914 he correctly predicted that a new major war would defeat the Russian Empire and the Central Powers. When World War I began in 1914, Piłsudski's Legions fought alongside Austria-Hungary against Russia. In 1917, with Imperalist Russia faring poorly in the war, he withdrew his support for the Central Powers and was imprisoned in Magdeburg by the Germans. From November 1918, when Poland regained its independence, until 1922, Piłsudski was Poland's Chief of State. In 1919–21 he commanded Polish forces in six border wars that re-defined the country's borders. On the verge of defeat in the Polish–Soviet War his forces, in the August 1920 Battle of Warsaw, threw back the invading Soviet Russians. In 1923, with the government dominated by his opponents, in particular the National Democrats, Piłsudski retired from active politics. Three years later he returned to power in the May 1926 coup d'état and became Poland's strongman. From then on until his death in 1935, he concerned himself primarily with military and foreign affairs. It was during this period that he developed a cult of personality that has survived into the 21st century. In international affairs, Piłsudski pursued two complementary strategies meant to secure Poland's independence and to enhance national security: "Prometheism", aimed at achieving the disintegration of Imperial Russia and later the Soviet Union into their constituent nations; and the creation of an Intermarium federation of Central and Eastern European states lying between the Baltic and Black Seas, to secure its peoples against Western and Eastern European imperialisms. Historian Piotr Wandycz characterizes Piłsudski as "an ardent Polish patriot who on occasion would castigate the Poles for their stupidity, cowardice, or servility. He described himself as a Polish-Lithuanian, and was stubborn and reserved, loath to show his emotions." Some aspects of Piłsudski's administration, such as establishing Bereza Kartuska prison, described by many as a concentration camp, remain controversial. Yet he is highly esteemed in Polish memory and is regarded, together with his chief antagonist Roman Dmowski, as a founder of the modern independent Poland. He was born 5 December 1867 to the noble family Piłsudski, at their manor named Zułów, near the village of Zułowo (now Zalavas, Švenčionys District Municipality, Lithuania), in the Russian Empire since 1795 on the territory of the former Polish–Lithuanian Commonwealth. The estate was part of the dowry brought by his mother, Maria, a member of the wealthy Billewicz family. The Piłsudski family, although pauperized, cherished Polish patriotic traditions and has been characterized either as Polish or as Polonized-Lithuanian. [b] Józef was the second son born to the family. Józef, when he attended the Russian gymnasium in Wilno (now Vilnius, Lithuania), was not an especially diligent student. One of the younger Polish students at this gymnasium was the future Russian communist leader Feliks Dzierżyński, who later would become Piłsudski's arch-enemy. Along with his brothers Bronisław, Adam and Jan, Józef was introduced by his mother Maria, née Billewicz, to Polish history and literature, which were suppressed by the Russian authorities. His father, likewise named Józef, had fought in the January 1863 Uprising against Russian rule of Poland. The family resented the Russian government's Russification policies. Young Józef profoundly disliked having to attend Russian Orthodox Church service and left school with an aversion not only for the Russian Tsar and the Russian Empire, but for the culture, which he knew well. In 1885 Piłsudski started medical studies at Kharkov University (now Kharkiv, Ukraine), where he became involved with Narodnaya Volya, part of the Russian Narodniki revolutionary movement. In 1886, he was suspended for participating in student demonstrations. He was rejected by the University of Dorpat (now Tartu, Estonia), whose authorities had been informed of his political affiliation. On 22 March 1887, he was arrested by Tsarist authorities on a charge of plotting with Vilnius socialists to assassinate Tsar Alexander III. In fact, Piłsudski's main connection to the plot was the involvement of his elder brother Bronisław, who was sentenced to fifteen years of hard labor (katorga) in eastern Siberia. Józef received a milder sentence: five years' exile in Siberia, first at Kirensk on the Lena River, then at Tunka. While being transported in a prisoners' convoy to Siberia, Piłsudski was held for several weeks at a prison in Irkutsk. There, he took part in what the authorities viewed as a revolt. After one of the inmates had insulted a guard and refused to apologize, he and other political prisoners were beaten by the guards for their defiance; Piłsudski lost two teeth and took part in a subsequent hunger strike until the authorities reinstated political prisoners' privileges that had been suspended after the incident. For his involvement, he was sentenced in 1888 to six months' imprisonment. He had to spend the first night of his incarceration in 40-degree-below-zero Siberian cold; this led to an illness that nearly killed him and to health problems that would plague him throughout life. During his years of exile in Siberia, Piłsudski met many Sybiraks, including Bronisław Szwarce, who had almost become a leader of the January 1863 Uprising. He was allowed to work in an occupation of his own choosing, and earned his living tutoring local children in mathematics and foreign languages (he knew French, German and Lithuanian in addition to Russian and his native Polish; he would later learn English). Local officials decided that as a Polish noble he was not entitled to the 10-ruble pension received by most other exiles. In 1892 Piłsudski returned from exile and settled in Adomavas Manor near Teneniai (now in Šilalė district). In 1893 he joined the Polish Socialist Party (PPS) and helped organize its Lithuanian branch. Initially he sided with the Socialists' more radical wing, but despite the socialist movement's ostensible internationalism he remained a Polish nationalist. In 1894, as its chief editor, he began publishing an underground socialist newspaper, Robotnik (The Worker); he would also be one of its chief writers, and, initially, a typesetter. In 1895, he became a PPS leader and took the position that doctrinal issues were of minor importance and that socialist ideology should be merged with nationalist ideology, since that combination offered the greatest chance of restoring Polish independence. On 15 July 1899, while an underground organizer, Piłsudski married a fellow socialist organizer, Maria Juszkiewiczowa, née Koplewska. According to his chief biographer, Wacław Jędrzejewicz, the marriage was less romantic than pragmatic in nature. Both were very involved in the socialist and independence movements. The printing press of "Robotnik" was in their apartment first in Wilno, then in Łódź. Having a pretext of regular family life made them less subject to suspicion. Russian law also protected a wife from prosecution for the illegal activities of her husband. The marriage deteriorated when, several years later, Piłsudski began an affair with a younger socialist, Aleksandra Szczerbińska. Maria died in 1921, and in October that year Piłsudski married Aleksandra. By then the couple had two daughters, Wanda and Jadwiga. In February 1900, after Russian authorities found Robotnik's underground printing press in Łódź, Piłsudski was imprisoned at the Warsaw Citadel. But, after feigning mental illness in May 1901, he managed to escape from a mental hospital at Saint Petersburg with the help of a Polish physician, Władysław Mazurkiewicz, and others, fleeing to Galicia, then part of Austria-Hungary and thence to Leytonstone in London where he stayed with Leon Wasilewski and his family. At the time, when almost all parties in Russian Poland and Lithuania took a conciliatory position toward the Russian Empire and aimed at negotiating within it a limited autonomy for Poland, Piłsudski's PPS was the only political force that was prepared to fight the Empire for Polish independence and to resort to violence in order to achieve that goal. On the outbreak of the Russo-Japanese War (1904–1905), in the summer of 1904, Piłsudski traveled to Tokyo, Japan, where he tried unsuccessfully to obtain that country's assistance for an uprising in Poland. He offered to supply Japan with intelligence in support of its war with Russia, and proposed the creation of a Polish Legion from Poles, conscripted into the Russian Army, who had been captured by Japan. He also suggested a "Promethean" project directed at breaking up the Russian Empire, a goal that he later continued to pursue. Meeting with Yamagata Aritomo, he suggested that starting a guerrilla war in Poland would distract Russia and asked for Japan to supply him with weapons. Although the Japanese diplomat Hayashi Tadasu supported the plan, the Japanese government, including Yamagata, was more skeptical. Piłsudski's arch-rival Roman Dmowski travelled to Japan, where he argued against Piłsudski's plan, endeavoring to discourage the Japanese government from supporting a Polish revolution, which Dmowski felt would then be doomed to failure. Dmowski, himself a Polish patriot, would remain Piłsudski's political archenemy to the end of Piłsudski's life. In the end, the Japanese offered Piłsudski much less than he had hoped for; he received Japan's help in purchasing weapons and ammunition for the PPS and its combat organisation, and the Japanese declined the Legion proposal. In the fall of 1904, Piłsudski formed a paramilitary unit (the Combat Organization of the Polish Socialist Party, or bojówki) aiming to create an armed resistance movement against the Russian authorities. The PPS organized an increasing numbers of demonstrations, mainly in Warsaw; on 28 October 1904, Russian Cossack cavalry attacked a demonstration, and in reprisal, during a demonstration on 13 November Piłsudski's paramilitary opened fire on Russian police and military. Initially concentrating their attention on spies and informers, in March 1905 the paramilitary began using bombs to assassinate selected Russian police officers. During the Russian Revolution of 1905, Piłsudski played a leading role in events in Congress Poland. In early 1905 he ordered the PPS to launch a general strike there; it involved some 400,000 workers and lasted two months until it was broken by the Russian authorities. In June 1905, Piłsudski sent paramilitary aid to an uprising in Łódź. During the "June Days", as the Łódź uprising came to be known, armed clashes broke out between Piłsudski's paramilitaries and gunmen loyal to Dmowski and his National Democrats. On 22 December 1905, Piłsudski called for all Polish workers to rise up; the call went largely unheeded. Unlike the National Democrats, Piłsudski instructed the PPS to boycott the elections to the First Duma. The decision and his resolve to try to win Polish independence through uprisings caused tensions within the PPS, and in November 1906, the party fractured over Piłsudski's leadership. His faction came to be called the "Old Faction" or "Revolutionary Faction" ("Starzy" or "Frakcja Rewolucyjna"), while their opponents were known as the "Young Faction", "Moderate Faction" or "Left Wing" ("Młodzi", "Frakcja Umiarkowana", "Lewica"). The "Young" sympathized with the Social Democrats of the Kingdom of Poland and Lithuania and believed that priority should be given to co-operation with Russian revolutionaries in toppling the tsarist regime and creating a socialist utopia that would facilitate negotiations for independence. Piłsudski and his supporters in the Revolutionary Faction continued to plot a revolution against Tsarist Russia that would secure Polish independence. By 1909, his faction would again be the majority in the PPS, and Piłsudski would remain one of the most important PPS leaders until the outbreak of the First World War. Piłsudski anticipated a coming European war and the need to organize the nucleus of a future Polish Army, which could help win Poland's independence from the three empires that had partitioned it out of political existence in the late 18th century. In 1906 Piłsudski, with the connivance of the Austrian authorities, founded a military school in Kraków for the training of paramilitary units. In 1906 alone, the 800-strong paramilitaries, operating in five-man teams in Congress Poland, killed 336 Russian officials; in subsequent years, the number of their casualties declined, and the paramilitaries' numbers increased to some 2,000 in 1908. The paramilitaries also held up Russian currency transports that were leaving Polish territories. On the night of 26/27 September 1908, they robbed a Russian mail train that was carrying tax revenues from Warsaw to Saint Petersburg. Piłsudski, who took part in this Bezdany raid near Vilnius, used the funds thus "expropriated" to finance his secret military organization. The take from that single raid (200,812 rubles) was a fortune for the time and equaled the paramilitaries' entire takes of the two preceding years. In 1908, Piłsudski transformed his paramilitary units into an "Association for Active Struggle" (Związek Walki Czynnej, or ZWC), headed by three of his associates, Władysław Sikorski, Marian Kukiel and Kazimierz Sosnkowski. One of the ZWC's main purposes was to train officers and noncommissioned officers for a future Polish Army. In 1910, two legal paramilitary organizations were created in the Austrian zone of Poland, one in Lwów (now Lviv, Ukraine) and one in Kraków, to conduct training in military science. With the permission of the Austrian authorities, Piłsudski founded a series of "sporting clubs", then the Riflemen's Association, which served as cover to train a Polish military force. In 1912 Piłsudski (using the nom de guerre, "Mieczysław") became commander-in-chief of a Riflemen's Association (Związek Strzelecki) that grew by 1914 to 12,000 men. In 1914, Piłsudski declared, "Only the sword now carries any weight in the balance for the destiny of a nation." At a meeting in Paris in 1914, Piłsudski presciently declared that in the impending war, for Poland to regain independence, Russia must be beaten by the Central Powers (the Austro-Hungarian and German Empires), and the latter powers must in their turn be beaten by France, Britain and the United States. By contrast, Roman Dmowski, Piłsudski's rival, believed that the best way to achieve a unified and independent Poland was to support the Triple Entente against the Central Powers. At the outbreak of the war on 3 August in Kraków, Piłsudski formed a small cadre military unit, the First Cadre Company, from members of the Riflemen's Association and Polish Rifle Squads. That same day, a cavalry unit under Władysław Belina-Prażmowski was sent to reconnoitre across the Russian border even before the official declaration of war between Austria-Hungary and Russia, which ensued on 6 August. Piłsudski's strategy was to send his forces north across the border into Russian Poland into an area that the Russian Army had evacuated in the hope of breaking through to Warsaw and sparking a national uprising. Using his limited forces in those early days, he backed his orders with the sanction of a fictitious "National Government in Warsaw", and he bent and stretched Austrian orders to the utmost, taking initiatives, moving forward and establishing Polish institutions in liberated towns while the Austrians saw his forces as good only for scouting or for supporting main Austrian formations. On 12 August 1914, Piłsudski's forces took the town of Kielce, of Kielce Governorate, but Piłsudski found the populace less supportive than he had expected. Soon afterward he officially established the Polish Legions, taking personal command of their First Brigade, which he would lead successfully into several victorious battles. He also secretly informed the British government in the fall of 1914 that his Legions would never fight France or Britain, only Russia. Piłsudski decreed that Legions' personnel were to be addressed by the French Revolution-inspired "Citizen" (Obywatel), and he was referred to as "the Commandant" ("Komendant"). Piłsudski enjoyed extreme respect and loyalty from his men, which would remain for years to come. The Polish Legions fought against Russia, at the side of the Central Powers, until 1917. Soon after forming the Legions, also in 1914, Piłsudski set up another organization, the Polish Military Organisation (Polska Organizacja Wojskowa), which served as a precursor Polish intelligence agency and was designed to perform espionage and sabotage missions. In mid-1916, after the Battle of Kostiuchnówka (4–6 July 1916), in which the Polish Legions delayed a Russian offensive at a cost of over 2,000 casualties, Piłsudski demanded for the Central Powers to issue a guarantee of independence for Poland. He backed that demand with his own proffered resignation and that of many of the Legions' officers. On 5 November 1916 the Central Powers proclaimed the "independence" of Poland, hoping to increase the number of Polish troops that could be sent to the Eastern Front against Russia, thereby relieving German forces to bolster the Western Front. Piłsudski agreed to serve in the Regency Kingdom of Poland, created by the Central Powers, and acted as minister of war in the newly formed Polish Regency government; as such, he was responsible for the Polnische Wehrmacht. After the Russian Revolution in early 1917, and in view of the worsening situation of the Central Powers, Piłsudski took an increasingly uncompromising stance, insisting that his men no longer be treated as "German colonial troops" and but be used to fight only Russia. Anticipating the Central Powers' defeat in the war, he did not wish to be allied with the losing side. In the aftermath of a July 1917 "Oath Crisis" when Piłsudski forbade Polish soldiers to swear a loyalty oath to the Central Powers, he was arrested and imprisoned at Magdeburg; the Polish units were disbanded and the men were incorporated into the Austro-Hungarian Army while the Polish Military Organization began attacking German targets. Piłsudski's arrest greatly enhanced his reputation among Poles, many of whom began to see him as the most determined Polish leader, who was willing to take on all the partitioning powers. On 8 November 1918, three days before the Armistice, Piłsudski and his colleague, Colonel Kazimierz Sosnkowski, were released by the Germans from Magdeburg and soon, like Vladimir Lenin before them, placed on a private train, bound for their national capital, as the collapsing Germans hoped that Piłsudski would create a force that was friendly to them. On 11 November 1918 in Warsaw, Piłsudski was appointed Commander in Chief of Polish forces by the Regency Council and was entrusted with creating a national government for the newly independent country. On that very day, which would become Poland's Independence Day, he proclaimed an independent Polish state. That week too, Piłsudski also negotiated the evacuation of the German garrison from Warsaw and of other German troops from the "Ober Ost" authority. Over 55,000 Germans would peacefully depart Poland, leaving their weapons to the Poles. In coming months, over 400,000 total would depart Polish territories. On 14 November 1918, Piłsudski was asked to supervise provisionally the running of the country. On 22 November he officially received, from the new government of Jędrzej Moraczewski, the title of Provisional Chief of State (Naczelnik Państwa) of renascent Poland. 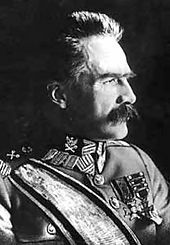 Various Polish military organizations and provisional governments (the Regency Council in Warsaw; Ignacy Daszyński's government in Lublin; and the Polish Liquidation Committee in Kraków) bowed to Piłsudski, who set about forming a new coalition government. It was predominantly socialist and introduced many reforms long proclaimed as necessary by the Polish Socialist Party, such as the eight-hour day, free school education and women's suffrage, to avoid major unrest. However, Piłsudski believed that as head of state, he must be above partisan politics. The day after his arrival in Warsaw, he met with old colleagues from underground days, who addressed him socialist-style as "Comrade" ("Towarzysz") and asked for his support for their revolutionary policies; he refused it and answered: "Comrades, I took the red tram of socialism to the stop called Independence, and that's where I got off. You may keep on to the final stop if you wish, but from now on let's address each other as 'Mister' [rather than continue using the socialist term of address, 'Comrade']!" He declined to support any party and did not form any political organization of his own; instead, he advocated creating a coalition government. He also set about organizing a Polish army out of Polish veterans of the German, Russian and Austrian armies. In the days immediately after the war, Piłsudski attempted to build a government in a shattered country. Much of former Russian Poland had been destroyed in the war, and systematic looting by the Germans had reduced the region's wealth by at least 10%. A British diplomat who visited Warsaw in January 1919 reported: "I have nowhere seen anything like the evidences of extreme poverty and wretchedness that meet one's eye at almost every turn." In addition, the country had to unify the disparate systems of law, economics, and administration in the former German, Austrian, and Russian sectors of Poland. There were nine legal systems, five currencies, and 66 types of rail systems (with 165 models of locomotives), which all had to be consolidated on an expedited basis. Wacław Jędrzejewicz, in Piłsudski: A Life for Poland, described Piłsudski as very deliberate in his decision-making: Piłsudski collected all available pertinent information, then took his time weighing it before arriving at a final decision. He drove himself hard, working all day and all night. He maintained a simple lifestyle, eating plain meals alone at an inexpensive restaurant. Though he was popular with much of the Polish public, his reputation as a loner (the result of many years' underground work) and as a man who distrusted almost everyone led to strained relations with other Polish politicians. Piłsudski and the first Polish government were distrusted in the West because he had co-operated with the Central Powers in 1914 to 1917 and because the governments of Daszyński and Jędrzej Moraczewski were primarily socialist. It was not until January 1919, when the world-famous pianist and composer Ignacy Jan Paderewski became Prime Minister of Poland and foreign minister of a new government, that it was recognized in the West. That still left two separate governments claiming to be Poland's legitimate government: Piłsudski's in Warsaw and Dmowski's in Paris. To ensure that Poland had a single government and to avert civil war, Paderewski met with Dmowski and Piłsudski and persuaded them to join forces, with Piłsudski acting as Provisional Chief of State and Commander-in-Chief while Dmowski and Paderewski represented Poland at the Paris Peace Conference. Articles 87–93 of the Treaty of Versailles and the Little Treaty of Versailles, signed on 28 June 1919, formally established Poland as an independent and sovereign state in the international arena. Piłsudski often clashed with Dmowski for viewing the Poles as the dominant nationality in renascent Poland, and attempting to send the Blue Army to Poland through Danzig, Germany (now Gdańsk, Poland). On 5 January 1919, some of Dmowski's supporters (Marian Januszajtis-Żegota and Eustachy Sapieha) attempted a coup against Piłsudski and Prime Minister Moraczewski, but they failed. On 20 February 1919, Piłsudski declared that he would return his powers to the newly elected Polish parliament (Sejm). However, the Sejm reinstated his office in the Little Constitution of 1919. The word "Provisional" was struck from his title, and Piłsudski would hold the office until 9 December 1922, when Gabriel Narutowicz was elected as the first president of Poland. Piłsudski's major foreign policy initiative was then a proposed federation (to be called "Międzymorze" (Polish for "Between-Seas"), and also known from the Latin as Intermarium, stretching from the Baltic Sea to the Black Sea). It was to consist of Poland, the independent Baltic states, Belarus, and Ukraine, somewhat in emulation of the pre-partition Polish-Lithuanian Commonwealth. Piłsudski's plan met with opposition from most of the prospective member states, which refused to relinquish any of their hard-won independence, as well as from the Allied powers, who thought it to be too bold a change to the existing balance-of-power structure. According to historian George Sanford, it was around 1920 that Piłsudski came to realize the infeasibility of that version of his Intermarium project. Instead of a Central and Eastern European alliance, there soon appeared a series of border conflicts, including the Polish-Ukrainian War (1918–19), the Polish-Lithuanian War (1920, culminating in Żeligowski's Mutiny), Polish-Czechoslovak border conflicts (beginning in 1918), and most notably the Polish-Soviet War (1919–21). Winston Churchill commented, "The war of giants has ended, the wars of the pygmies begun." In the aftermath of World War I, there was unrest on all Polish borders. Regarding Poland's future frontiers, Piłsudski said, "All that we can gain in the west depends on the Entente—on the extent to which it may wish to squeeze Germany". In the east, "there are doors that open and close, and it depends on who forces them open and how far". In 1918 in the east, Polish forces clashed with Ukrainian forces in the Polish–Ukrainian War, and Piłsudski's first orders as Commander-in-Chief of the Polish Army, on 12 November 1918, were to provide support for the Polish struggle in Lviv. Piłsudski was aware that the Bolsheviks were no friends of independent Poland and that war with them was inevitable. He viewed their advance west as a major problem, but he also considered the Bolsheviks less dangerous for Poland than their White opponents. The "White Russians", representatives of the old Russian Empire, were willing to accept only limited independence for Poland, probably within borders similar to those of the former Congress Poland, and they clearly objected to Polish control of Ukraine, which was crucial for Piłsudski's Intermarium project. That was in contrast to the Bolsheviks, who proclaimed the partitions of Poland null and void. Piłsudski thus speculated that Poland would be better off with the Bolsheviks, alienated from the Western powers, than with a restored Russian Empire. By ignoring the strong pressures from the Entente Cordiale to join the attack on Lenin's struggling Bolshevik government, Piłsudski probably saved it in the summer and the fall of 1919. In March 1920, Piłsudski was made "First Marshal of Poland". In the wake of the Russian westward offensive of 1918–1919 and of a series of escalating battles that resulted in the Poles advancing eastward, on 21 April 1920, Marshal Piłsudski (as his rank had been since March 1920) signed a military alliance (the Treaty of Warsaw) with Ukrainian leader Symon Petliura to conduct joint operations against Soviet Russia. The goal of the Polish-Ukrainian Treaty was to establish an independent Ukraine and independent Poland in alliance, resembling that once existing within Polish–Lithuanian Commonwealth In return, Petliura gave up Ukrainian claims to western lands of Galicia being a historical part of the Crown of Poland for which he was denounced by Ukrainian nationalist leaders. The Polish and the Ukrainian Armies, under Piłsudski's command, launched a successful offensive against the Russian forces in Ukraine. On 7 May 1920, with remarkably little fighting, they captured Kiev. The Bolshevik leadership framed the Polish actions as an invasion; in response, thousands of officers and deserters joined the Red Army, and thousands of civilians volunteered for war work. The Soviets launched a counter-offensive from Belarus and counterattacked in Ukraine, advancing into Poland in a drive toward Germany to encourage the Communist Party of Germany in its struggle to take power. Soviet confidence soared. The Soviets announced their plans to invade Western Europe; Soviet communist theoretician Nikolai Bukharin, writing in Pravda, hoped for the resources to carry the campaign beyond Warsaw "straight to London and Paris". Soviet commander Mikhail Tukhachevsky's order of the day for 2 July 1920 read: "To the West! Over the corpse of White Poland lies the road to worldwide conflagration. March upon Vilnius, Minsk, Warsaw!" and "onward to Berlin over the corpse of Poland!" On 1 July 1920, in view of the rapidly advancing Soviet offensive, Poland's parliament, the Sejm, formed a Council for Defense of the Nation, chaired by Piłsudski, to provide expeditious decision-making as a temporary supplanting of the fractious Sejm. The National Democrats, however, contended that the string of Bolshevik victories had been Piłsudski's fault and demanded that for him to resign; some even accused him of treason. Their 19 July failure to carry a vote of no-confidence in the council led to Dmowski's withdrawal from it. On 12 August, Piłsudski tendered his resignation to Prime Minister Wincenty Witos, offering to be the scapegoat if the military solution failed, but Witos refused to accept his resignation. The Entente pressured Poland to surrender and enter into negotiations with the Bolsheviks. Piłsudski, however, was a staunch advocate of continuing the fight. As Norman Davies noted, at that time, especially abroad, "Piłsudski had nothing of his later prestige. As a pre-war revolutionary he led his party to splits and quarrels; as a general in World War I he led his legions to internment and disbanding; as a marshal of the Polish Army he led it to Kiev and Vilnius, both now lost to Poles. He left the Polish Socialist Party and his Austro-German allies; refused to ally himself with Entente. In France and England he was considered a treasonous ally who leads Poland into destruction; in Russia he was seen as a false servant of the allies, who will lead imperialism to ruin. All – from Lenin to Lloyd George, from Pravda to Morning Star – considered him a military and political failure. In August 1920 all were in agreement that his catastrophic career will be crowned with the fall of Warsaw". However, over the next few weeks, Poland's risky, unconventional strategy at the August 1920 Battle of Warsaw halted the Soviet advance. The Polish plan was developed by Piłsudski and others, including Tadeusz Rozwadowski. Later, some supporters of Piłsudski would seek to portray him as the sole author of the Polish strategy, but opponents would seek to minimize his role. In the West for a long time a myth persisted that it was General Maxime Weygand of the French Military Mission to Poland who had saved Poland; modern scholars, however, are in agreement that Weygand's role was minimal, at best. Piłsudski's plan called for Polish forces to withdraw across the Vistula River and to defend the bridgeheads at Warsaw and on the Wieprz River while some 25% of the available divisions concentrated to the south for a strategic counteroffensive. The plan next required two armies under General Józef Haller, facing Soviet frontal attack on Warsaw from the east, to hold their entrenched positions at all costs. At the same time, an army under General Władysław Sikorski was to strike north from outside Warsaw, cutting off Soviet forces that sought to envelope the Polish capital from that direction. The most important role, however, was assigned to a relatively small, approximately 20,000-man, newly assembled "Reserve Army" (also known as the "Strike Group", "Grupa Uderzeniowa"), comprising the most determined, battle-hardened Polish units that were commanded personally by Piłsudski. Their task was to spearhead a lightning northward offensive, from the Vistula-Wieprz triangle south of Warsaw, through a weak spot that had been identified by Polish intelligence between the Soviet Western and Southwestern Fronts. That offensive would separate the Soviet Western Front from its reserves and disorganize its movements. Eventually, the gap between Sikorski's army and the "Strike Group" would close near the East Prussian border, bringing about the destruction of the encircled Soviet forces. At the time, Piłsudski's plan was strongly criticized, and only the desperate situation of the Polish forces persuaded other commanders to go along with it. Though based on reliable intelligence, including decrypted Soviet radio communications, the plan was termed "amateurish" by high-ranking army officers and military experts, who were quick to point out Piłsudski's lack of formal military education. When a copy of the plan fell into Soviet hands, Western Front commander Mikhail Tukhachevsky thought it to be a ruse and disregarded it. Days later, the Soviets paid dearly for that when, during the Battle of Warsaw, the overconfident Red Army suffered one of its greatest defeats ever. A National Democrat Sejm deputy, Stanisław Stroński, coined the phrase, "Miracle at the Vistula" ("Cud nad Wisłą"), to express his disapproval of Piłsudski's "Ukrainian adventure". Stroński's phrase was adopted as praise for Piłsudski by some patriotically- or piously-minded Poles, who were unaware of Stroński's ironic intent. A junior member of the French military mission, Charles de Gaulle, would later adopt some lessons from the Polish-Soviet War as well as from Piłsudski's career. In February 1921, Piłsudski visited Paris, where, in negotiations with French President Alexandre Millerand, he laid the foundations for the Franco-Polish Military Alliance, which would be signed later that year. The Treaty of Riga, which ended the Polish-Soviet War in March 1921, partitioned Belarus and Ukraine between Poland and Russia. Piłsudski called the treaty an "act of cowardice". The treaty and his secret approval of General Lucjan Żeligowski's capture of Vilnius from the Lithuanians marked an end to this incarnation of Piłsudski's federalist Intermarium plan. 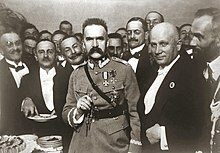 On 25 September 1921, when Piłsudski visited Lwów (now Lviv) for the opening of the first Eastern Trade Fair (Targi Wschodnie), he was the target of an unsuccessful assassination attempt by Stepan Fedak, acting on behalf of Ukrainian-independence organizations, including the Ukrainian Military Organization. 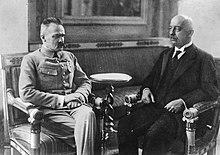 At Belweder Palace, Chief of State Piłsudski (left) transferred his powers to President-elect Gabriel Narutowicz (right). Two days later, the President was assassinated. After the Polish Constitution of March 1921 severely limited the powers of the presidency intentionally, to prevent a President Piłsudski from waging war. He declined to run for the office. On 9 December 1922, the Polish National Assembly elected Gabriel Narutowicz of Polish People's Party "Wyzwolenie"; his election, opposed by the right-wing parties, caused public unrest. On 14 December at the Belweder Palace, Piłsudski officially transferred his powers as Chief of State to his friend Narutowicz; the Naczelnik was replaced by the President. At Warsaw's Hotel Bristol, 3 July 1923, Piłsudski announced his retirement from active politics. Two days later, on 16 December 1922, Narutowicz was shot dead by a right-wing painter and art critic, Eligiusz Niewiadomski, who had originally wanted to kill Piłsudski but had changed his target, influenced by National Democrat anti-Narutowicz propaganda. For Piłsudski, that was a major shock, which shook his belief that Poland could function as a democracy and made him support government by a strong hand. He became Chief of the General Staff and, together with Minister of Military Affairs Władysław Sikorski, managed to stabilize the situation, quelling unrest with a brief state of emergency. Stanisław Wojciechowski of Polish People's Party "Piast" (PSL Piast), another of Piłsudski's old colleagues, was elected the new president, and Wincenty Witos, also of PSL Piast, became prime minister. However, the new government, pursuant to the Lanckorona Pact, an alliance among the centrist PSL Piast and the right-wing Popular National Union and Christian Democrat parties, contained right-wing enemies of Piłsudski, people whom he held morally responsible for Narutowicz's death and with whom he found it impossible to work. On 30 May 1923, Piłsudski resigned as Chief of the General Staff. After General Stanisław Szeptycki proposed that the military should be more closely supervised by civilian authorities, Piłsudski criticized that as an attempt to politicize the army, and on 28 June, he resigned his last political appointment. The same day, the Sejm's left-wing deputies voted a resolution, thanking him for his past work. Piłsudski went into retirement in Sulejówek, outside Warsaw, at his country manor, "Milusin", which had been presented to him by his former soldiers. There, he settled down to supporting his family by writing a series of political and military memoirs, including Rok 1920 (The Year 1920). Piłsudski on Warsaw's Poniatowski Bridge during the May 1926 Coup d'État. At the right is General Gustaw Orlicz-Dreszer. Meanwhile, Poland's economy was in shambles. Hyperinflation fueled public unrest, and the government was unable to find a quick solution to the mounting unemployment and economic crisis. Piłsudski's allies and supporters repeatedly asked him to return to politics, and he began to create a new power base, centred on former members of the Polish Legions and the Polish Military Organization as well as some left-wing and intelligentsia parties. In 1925, after several governments had resigned in short order and the political scene was becoming increasingly chaotic, Piłsudski became more and more critical of the government and eventually issued statements demanding the resignation of the Witos cabinet. When the Chjeno-Piast coalition, which Piłsudski had strongly criticized, formed a new government, on 12–14 May 1926, Piłsudski returned to power in a coup d'état (the May Coup), supported by the Polish Socialist Party, Liberation, the Peasant Party and even the Polish Communist Party. Piłsudski had hoped for a bloodless coup, but the government had refused to back down; 215 soldiers and 164 civilians had been killed, and over 900 persons had been wounded. On 31 May, the Sejm elected Piłsudski president of the Republic. Piłsudski, however, aware of the presidency's limited powers, refused the office. Another of his old friends, Ignacy Mościcki, was elected in his stead. Mościcki then appointed Piłsudski as Minister of Military Affairs (defence minister), a post that he would hold for the rest of his life in 11 successive governments, two of which he headed himself from 1926 to 1928 and for a brief period in 1930. He also served as General Inspector of the Armed Forces, and Chairman of The War Council. Piłsudski had no plans for major reforms; he quickly distanced himself from the most radical of his left-wing supporters and declared that his coup was to be a "revolution without revolutionary consequences". His goals were to stabilize the country; reduce the influence of political parties, which he blamed for corruption and inefficiency; and strengthen the army. His role in the Polish government over the subsequent years has been called a dictatorship or a "quasi-dictatorship". In internal politics, Piłsudski's coup entailed sweeping limitations on parliamentary government, as his Sanation regime (1926–1939), at times employing authoritarian methods, sought to "restore public life to moral health". From 1928, the Sanation authorities were represented in the sphere of practical politics by the Non-partisan Bloc for Cooperation with the Government (BBWR). Popular support and an effective propaganda apparatus allowed Piłsudski to maintain his authoritarian powers, which could not be overruled either by the president, who was appointed by Piłsudski, or by the Sejm. The powers of the Sejm were curtailed by constitutional amendments that were introduced soon after the coup, on 2 August 1926. From 1926 to 1930, Piłsudski relied chiefly on propaganda to weaken the influence of opposition leaders. The culmination of his dictatorial and supralegal policies came in the 1930s, with the imprisonment and trial of certain political opponents (the Brest trials) on the eve of the 1930 legislative elections and with the 1934 establishment of a prison for political prisoners at Bereza Kartuska (today Biaroza), where some prisoners were brutally mistreated. After the BBWR's 1930 victory, Piłsudski left most internal matters in the hands of his "colonels" while he concentrated on military and foreign affairs. He came under considerable criticism for his treatment of political opponents and their 1930 arrest and imprisonment was internationally condemned and damaged Poland's reputation. Piłsudski became increasingly disillusioned with democracy in Poland. His intemperate public utterances (he called the Sejm a "prostitute") and his sending of 90 armed officers into the Sejm building in response to an impending vote of no-confidence caused concern in contemporary and modern observers who have seen his actions as setting precedents for authoritarian responses to political challenges. One of his main goals was to transform the parliamentary system into a presidential system; however, he opposed the introduction of totalitarianism. The adoption of a new Polish constitution in April 1935 that was tailored by Piłsudski's supporters to his specifications, providing for a strong presidency, came too late for Piłsudski to seek that office; but the April Constitution would serve Poland up to the outbreak of World War II and would carry its Government in Exile until the end of the war and beyond. Nonetheless, Piłsudski's government depended more on his charismatic authority than on rational-legal authority. None of his followers could claim to be his legitimate heir, and after his death, the Sanation structure would quickly fracture, returning Poland to the pre-Piłsudski era of parliamentary political contention. In 1933, Piłsudski paid homage at the tomb of John III Sobieski in commemoration of the 250th anniversary of Battle of Vienna. Piłsudski's regime began a period of national stabilization and of improvement in the situation of ethnic minorities, which formed about a third of the Second Republic's population. Piłsudski replaced the National Democrats' "ethnic-assimilation" with a "state-assimilation" policy: citizens were judged not by their ethnicity but by their loyalty to the state. Widely recognized for his opposition to the National Democrats' anti-Semitic policies, he extended his policy of "state-assimilation" to Polish Jews. The years 1926 to 1935 and Piłsudski himself were favorably viewed by many Polish Jews whose situation improved especially under Piłsudski-appointed Prime Minister Kazimierz Bartel. Many Jews saw Piłsudski as their only hope for restraining antisemitic currents in Poland and for maintaining public order; he was seen as a guarantor of stability and a friend of the Jewish people, who voted for him and actively participated in his political bloc. Piłsudski's death in 1935 brought a deterioration in the quality of life of Poland's Jews. During the 1930s, a combination of developments, from the Great Depression to the vicious spiral of OUN terrorist attacks and government pacifications, caused government relations with the national minorities to deteriorate. Unrest among national minorities was also related to foreign policy. Troubles followed repressions in the largely-Ukrainian eastern Galicia, where nearly 1,800 persons were arrested. Tension also arose between the government and Poland's German minority, particularly in Upper Silesia. The government did not yield to calls for antisemitic measures; but the Jews (8.6% of Poland's population) grew discontented for economic reasons that were connected with the Depression. Overall, by the end of Piłsudski's life, his government's relations with national minorities were increasingly problematic. In the military sphere, Piłsudski, who had shown himself an accomplished military strategist in engineering the "Miracle at the Vistula", has been criticized by some for subsequently concentrating on personnel management and allegedly neglecting modernization of military strategy and equipment. His experiences in the Polish-Soviet War (1919–1921) may have led him to overestimate the importance of cavalry and to neglect the development of armoured and air forces. Others, however, contend that, particularly from the late 1920s, he had supported the development of these military branches. The limitations on Poland's military modernization in this period may have been less doctrinal than financial. Under Piłsudski, Poland maintained good relations with neighboring Romania, Hungary and Latvia. Relations were strained with Czechoslovakia, however, and even worse with Lithuania. Relations with Weimar Germany and the Soviet Union varied over time, but during Piłsudski's tenure could, for the most part, be described as neutral. Piłsudski's Promethean programme to weaken the Russian Empire and its successor state, the Soviet Union, by supporting nationalist independence movements of major non-Russian peoples dwelling in Russia and the Soviet Union, was co-ordinated from 1927 to the 1939 outbreak of World War II in Europe by the military intelligence officer, Edmund Charaszkiewicz. In the interbellum, but it yielded few tangible results. Piłsudski sought to maintain his country's independence in the international arena. Assisted by his protégé, Foreign Minister Józef Beck, he sought support for Poland in alliances with western powers, such as France and the United Kingdom, and with friendly, if less powerful, neighbours, such as Romania and Hungary. A supporter of the Franco-Polish Military Alliance and the Polish-Romanian Alliance, part of the Little Entente, Piłsudski was disappointed by the French and British policy of appeasement evident in their signing of the Locarno Treaties. Piłsudski, therefore, aimed also to maintain good relations with the Soviet Union and Germany and so Poland signed non-aggression pacts with both of its powerful neighbours: the 1932 Soviet-Polish Non-Aggression Pact and the 1934 German-Polish Non-Aggression Pact. Both were meant to strengthen Poland's position in the eyes of its allies and neighbours. Piłsudski himself was acutely aware of the shakiness of the pacts, and he commented: "Having these pacts, we are straddling two stools. This cannot last long. We have to know from which stool we will tumble first, and when that will be". Critics of the two non-aggression pacts have accused Piłsudski of underestimating Hitler's aggressiveness, of giving Germany time to rearm and of allowing Stalin to eliminate opposition, primarily in Ukraine, which had been supported by Piłsudski's Promethean program. After Adolf Hitler came to power in Germany in January 1933, Piłsudski is rumored to have proposed to France a preventive war against Germany. It has been argued that Piłsudski may have been sounding out France regarding possible joint military action against Germany. Lack of French interest may have been a reason for Poland signing the Non-Aggression Pact of January 1934. Little evidence has, however, been found in French or Polish diplomatic archives that such a proposal for preventive war was ever actually advanced. Hitler repeatedly suggested a German-Polish alliance against the Soviet Union, but Piłsudski declined, instead seeking precious time to prepare for potential war with either Germany or the Soviet Union. 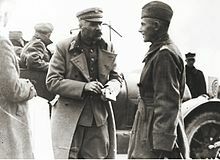 Just before his death, Piłsudski told Józef Beck that it must be Poland's policy to maintain neutral relations with Germany, keep up the Polish alliance with France and improve relations with the United Kingdom. Piłsudski's religious views are a matter of debate. He was baptised on 15 December 1867 in the church of Powiewiórka (then Sventsiany deanery) by the priest, Thomas Valinsky. His godparents were Joseph and Constance Martsinkovsky Ragalskaya. On 15 July 1899, at the village of Paproć Duża, near Łomża, he married Maria Piłsudska, a divorcée. As the Catholic Church did not recognise divorces, she and Piłsudski had converted to Protestantism. Pilsudski later returned to the Catholic Church in order to marry Aleksandra Piłsudska. Piłsudski and Aleksandra could not get married as Piłsudski's wife Maria refused to divorce him. It was only after Maria's death in 1921 that they were married, on 25 October of the same year. ("A mother and the heart of [her] son") and bears evocative lines from a poem by Słowacki. By 1935, unbeknownst to the public, Piłsudski had for several years been in declining health. On 12 May 1935, he died of liver cancer at Warsaw's Belweder Palace. The celebration of his life began spontaneously within half an hour of the announcement of his death. It was led by military personnel — former Legionnaires, members of the Polish Military Organization, veterans of the wars of 1919–21 — and by his political collaborators from his service as Chief of State and, later, Prime Minister and Inspector-General. The Polish Communist Party immediately attacked Piłsudski as a fascist and capitalist, though fascists themselves did not see him as one of them. Other opponents of the Sanation regime, however, were more civil; socialists (such as Ignacy Daszyński and Tomasz Arciszewski) and Christian Democrats (represented by Ignacy Paderewski, Stanisław Wojciechowski and Władysław Grabski) expressed condolences. The peasant parties split in their reactions (Wincenty Witos voicing criticism of Piłsudski, but Maciej Rataj and Stanisław Thugutt being supportive), while Roman Dmowski's National Democrats expressed a toned-down criticism. Condolences were expressed by the clergy, including Poland's Primate August Hlond, as well as by Pope Pius XI, who called himself a "personal friend" of Piłsudski. Notable appreciation for Piłsudski was expressed by Poland's ethnic and religious minorities. Eastern Orthodox, Greek Orthodox, Protestant, Judaic and Islamic organizations expressed condolences, praising Piłsudski for his policies of religious tolerance. His death was a shock to members of the Jewish minority, who even years after remembered him as a "very good man" who "protected Jews". Mainstream organizations of ethnic minorities similarly expressed their support for his policies of ethnic tolerance, though he was criticized by, in addition to the Polish communists, the Jewish Labour Bund, and Ukrainian, German and Lithuanian extremists. On the international scene, Pope Pius XI held a special ceremony 18 May in the Holy See, a commemoration was conducted at League of Nations Geneva headquarters, and dozens of messages of condolence arrived in Poland from heads of state across the world, including Germany's Adolf Hitler, the Soviet Union's Joseph Stalin, Italy's Benito Mussolini and King Victor Emmanuel III, France's Albert Lebrun and Pierre-Étienne Flandin, Austria's Wilhelm Miklas, Japan's Emperor Hirohito, and Britain's King George V.
Ceremonies, masses and an enormous funeral were held; a funeral train toured Poland. A series of postcards, stamps and postmarks was also released. In 1937, after a two-year display at St. Leonard's Crypt in Kraków's Wawel Cathedral, Piłsudski's body was laid to rest in the Cathedral's Crypt under the Silver Bells, except for his brain, which he had willed for study to Stefan Batory University, and his heart, which was interred in his mother's grave at Vilnius' Rasos Cemetery, where it remains. The 1937 relocation of his remains, made by his long-standing adversary Adam Sapieha, then Archbishop of Krakow, incited widespread protests that included calls for Sapieha's removal. On 13 May 1935, in accordance with Piłsudski's last wishes, Edward Rydz-Śmigły was named by Poland's president and government to be Inspector-General of the Polish Armed Forces, and on 10 November 1936, he was elevated to Marshal of Poland. Rydz was now one of the most powerful people in Poland, the "second man in the state after the President". While many saw Rydz-Śmigły as a successor to Piłsudski, he never became as influential. As the Polish government became increasingly authoritarian and conservative, the Rydz-Śmigły faction was opposed by that of the more moderate Ignacy Mościcki, who remained President. After 1938 Rydz-Śmigły reconciled with the President, but the ruling group remained divided into the "President's Men", mostly civilians (the "Castle Group", after the President's official residence, Warsaw's Royal Castle), and the "Marshal's Men" ("Piłsudski's Colonels"), professional military officers and old comrades-in-arms of Piłsudski's. After the German invasion of Poland in 1939, some of this political division would survive within the Polish government in exile. In 1935, at Piłsudski's funeral, President Mościcki eulogized the Marshal: "He was the king of our hearts and the sovereign of our will. During a half-century of his life's travails, he captured heart after heart, soul after soul, until he had drawn the whole of Poland within the purple of his royal spirit ... He gave Poland freedom, boundaries, power and respect." After World War II, little of Piłsudski's thought influenced the policies of the Polish People's Republic, a de facto satellite of the Soviet Union. In particular, Poland was in no position to resume Piłsudski's effort to build an Intermarium federation of Poland and some of its neighbors; and a "Promethean" endeavor to "break up the Russian state into its main constituents and emancipate the countries that have been forcibly incorporated into that empire." For a decade after World War II, Piłsudski was either ignored or condemned by Poland's communist government, along with the entire interwar Second Polish Republic. This began to change, however, particularly after de-Stalinization and the Polish October (1956), and historiography in Poland gradually moved away from a purely negative view of Piłsudski toward a more balanced and neutral assessment. After the fall of communism and the 1991 disintegration of the Soviet Union, Piłsudski once again came to be publicly acknowledged as a Polish national hero. On the sixtieth anniversary of his death, on 12 May 1995, Poland's Sejm adopted a resolution: "Józef Piłsudski will remain, in our nation's memory, the founder of its independence and the victorious leader who fended off a foreign assault that threatened the whole of Europe and its civilization. Józef Piłsudski served his country well and has entered our history forever." While some of Piłsudski's political moves remain controversial—particularly the May 1926 Coup d'état, the Brest trials (1931–32), the 1934 establishment of the Bereza Kartuska detention camp, and successive Polish governments' failure to formulate consistent, constructive policies toward the national minorities—Piłsudski continues to be viewed by most Poles as a providential figure in the country's 20th-century history. Piłsudski has lent his name to several military units, including the 1st Legions Infantry Division and armored train No. 51 ("I Marszałek"—"the First Marshal"). Also named for Piłsudski have been Piłsudski's Mound, one of four man-made mounds in Kraków; the Józef Piłsudski Institute of America, a New York City research center and museum on the modern history of Poland; the Józef Piłsudski University of Physical Education in Warsaw; a passenger ship, MS Piłsudski; a gunboat, ORP Komendant Piłsudski; and a racehorse, Pilsudski. Virtually every Polish city has its "Piłsudski Street". (There are, by contrast, few if any streets named after Piłsudski's National-Democrat arch-rival, Roman Dmowski, even in Dmowski's old Greater-Poland political stronghold). 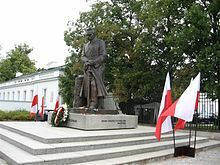 There are statues of Piłsudski in many Polish cities; the highest density of such statuary memorials is found in Warsaw, which has three in little more than a mile between the Belweder Palace, Piłsudski's residence, and Piłsudski Square. 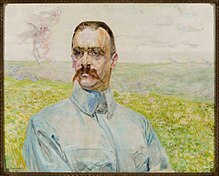 He was the subject of paintings by renowned artists such as Jacek Malczewski (1916) and Wojciech Kossak (leaning on his sword, 1928; and astride his horse, Kasztanka, 1928), as well as of numerous caricatures and photos. Piłsudski has been a character in numerous works of fiction, such as the 1922 novel Generał Barcz (General Barcz) by Juliusz Kaden-Bandrowski and the 2007 novel Ice (Lód) by Jacek Dukaj. Poland's National Library lists over 500 publications related to Piłsudski; the U.S. Library of Congress, over 300. Piłsudski's life was the subject of a 2001 Polish television documentary, Marszałek Piłsudski, directed by Andrzej Trzos-Rastawiecki. Both daughters of Marshal Piłsudski returned to Poland in 1990, after the fall of the Communist system. Jadwiga Piłsudska's daughter Joanna Jaraczewska returned to Poland in 1979. She married a Polish "Solidarity" activist Janusz Onyszkiewicz in a political prison in 1983. Both were very involved in the Polish struggle against communism between 1979 and 1989.
a. ^ Józef Klemens Piłsudski was commonly referred to without his middle name, as "Józef Piłsudski". A few English sources translate his first name as "Joseph", but this is not the common practice. As a young man, he belonged to underground organizations and used various pseudonyms, including "Wiktor", "Mieczysław" and "Ziuk" (the latter also being his family nickname). Later he was often affectionately called "Dziadek" ("Grandpa" or "the Old Man") and "Marszałek" ("the Marshal"). His ex-soldiers from the Legions also referred to him as "Komendant" ("the Commandant"). b. ^ Piłsudski sometimes spoke of being a Lithuanian of Polish culture. For several centuries, declaring both Lithuanian and Polish identity was not self-excluding alike in case of master of Polish poetry Adam Mickiewicz. The question of Piłsudski's ethnicity and culture simply does not match contemporary templates, the more the Polish–Lithuanian Commonwealth which Piłsudski regarded as his spiritual patria failed to reborn itself and finally ceased to exist in the wake of arising modern nationalisms. Timothy Snyder, who calls him a "Polish-Lithuanian", notes that Piłsudski did not think in terms of 20th-century nationalisms and ethnicities; he considered himself both a Pole and a Lithuanian, and his homeland was the historic Polish-Lithuanian Commonwealth. ^ a b c d e f g Drozdowski & Szwankowska 1995, pp. 9–11. ^ a b Davies 2005, 10. ^ a b c Roos 1966, p. 14; Rothschild 1990, p. 45. ^ Wandycz 1990, p. 452. ^ Jędrzejewicz 1990, p. 3. ^ Hetherington 2012, p. 92. ^ Hetherington 2012, p. 95. ^ a b c d e f g h i j k l m n o p q r s t u v w "History - Józef Piłsudski (1867–1935)". Poland.gov. Archived from the original on 13 February 2006. Retrieved 23 April 2006. ^ Urbankowski 1997, vol. 1, pp. 13-5. ^ Lerski 1996, p. 439. ^ Bideleux & Jeffries 1998, p. 186. ^ a b c d e f g h i j k l m n o p q r s t u v w x y z aa Chojnowski, Andrzej. "Piłsudski Józef Klemens". Internetowa encyklopedia PWN (in Polish). Archived from the original on 3 May 2008. Retrieved 15 January 2008. ^ "Bronisław Piotr Piłsudski - Calendar of events". ICRAP. Retrieved 2 March 2018. ^ Landau, Rom; Dunlop, Geoffrey (1930). Pilsudski, Hero of Poland. Jarrolds. pp. 30–2. ^ a b Urbankowski 1997, vol. 1, pp. 62-6. ^ a b Urbankowski 1997, vol. 1, pp. 68-9. ^ Urbankowski 1997, vol. 1, pp. 74-7. ^ Jędrzejewicz & Cisek 1994, p. 13. ^ Urbankowski 1997, vol. 1, p. 71. ^ Jędrzejewicz 1990, pp. 27-8 (1982 ed.). ^ a b c Urbankowski 1997, vol. 1, pp. 109-11. ^ Kowner 2006, p. 285. ^ a b c d e f g Zamoyski 1987, p. 330. ^ Urbankowski 1997, vol. 1, pp. 113-6. ^ Urbankowski 1997, vol. 1, pp. 117-8. ^ a b Urbankowski 1997, vol. 1, pp. 121-2. ^ a b c d e Józef Piłsudski at Encyclopædia Britannica. ^ Urbankowski 1997, vol. 1, pp. 171-2. ^ a b c d e f g h i j k l m n Cienciala 2002. ^ Urbankowski 1997, vol. 1, pp. 174-5. ^ Urbankowski 1997, vol. 1, pp. 178-9. ^ Urbankowski 1997, vol. 1, pp. 170-1, 180-2. ^ Rąkowski 2005, pp. 109-11. ^ Urbankowski 1997, vol. 1, pp. 251-2. ^ Rothschild 1990, p. 45. ^ Urbankowski 1997, vol. 1, pp. 256, 277-8. ^ MacMillan 2003, pp. 213–4. ^ "The Versailles Treaty 28 June 1919: Part III". The Avalon Project. articles 87-93. Archived from the original on 14 February 2008. Retrieved 15 January 2008. ^ MacMillan 2003, pp. 211, 214. ^ Urbankowski 1997, vol. 1, pp. 499-501. ^ Jędrzejewicz 1990, p. 93. ^ Szymczak, Robert. "Polish-Soviet War: Battle of Warsaw". TheHistoryNet. Archived from the original on 7 October 2007. Retrieved 10 October 2007. ^ Sanford 2002, pp. 5-6. ^ a b Urbankowski 1997, vol. 1, p. 281. ^ Davies 2003, p. 95ff. ^ Figes 1996, p. 699. "Within weeks of Brusilov's appointment, 14,000 officers had joined the army to fight the Poles, thousands of civilians had volunteered for war-work, and well over 100,000 deserters had returned to the Red Army on the Western Front". ^ See Lenin speech on 22 September 1920 at the 9th Conference of the Russian Communist Party. English translation in Pipes 1993, pp. 181–2 and excerpts in Cienciala 2002. The speech was first published in Artizov, Andrey; Usov, R.A. (1992). ""Я прошу записывать меньше: это не должно попадать в печать ...": Выступления В.И.Ленина на IX конференции РКП(б) 22 сентября 1920 г.". Istoricheskii Arkhiv (in Russian). 1 (1). ISSN 0869-6322. ^ Lawrynowicz, Witold. "Battle of Warsaw 1920". Polish Militaria Collector's Association in memory of Andrzej Zaremba. Archived from the original on 18 January 2012. Retrieved 5 November 2006. ^ Urbankowski 1997, vol. 1, pp. 341-6, 357-8. ^ a b c d Urbankowski 1997, vol. 1, pp. 341-6. ^ Davies 2003, p. 225. ^ a b Lönnroth et al. 1994, p. 230. ^ Szczepański, Janusz. "Kontrowersje Wokół Bitwy Warszawskiej 1920 Roku (Controversies surrounding the Battle of Warsaw in 1920)". Mówią Wieki online (in Polish). Archived from the original on 2 December 2007. Retrieved 15 January 2008. ^ Cisek 2002, pp. 140–1. ^ a b c Urbankowski 1997, vol. 1, pp. 346-441, 357-8. ^ Frątczak, Sławomir Z. (2005). "Cud nad Wisłą". Głos (in Polish) (32). Retrieved 26 June 2009. ^ Davies 2005, p. 399 (1982 ed. Columbia Univ. Press). ^ Urbankowski 1997, vol. 1, pp. 487-8. ^ Urbankowski 1997, vol. 1, pp. 489-90. ^ Urbankowski 1997, vol. 1, pp. 490-1. ^ Urbankowski 1997, vol. 1, p. 515. ^ Urbankowski 1997, vol. 1, pp. 528-9. ^ Biskupski 2012, p. 46. ^ Śleszyński, Wojciech (2003). "Aspekty prawne utworzenia obozu odosobnienia w Berezie Kartuskiej i reakcje środowisk politycznych. Wybór materiałów i dokumentów 1". Białoruskie Zeszyty Historyczne (in Polish). 20 – via kamunikat / Belarusian history journal. ^ "Pilsudski Bros". Time. 7 April 1930. ^ a b "Pilsudski v. Daszynski". Time. 11 November 1929. ^ Perlez, Jane (12 September 1993). "Visions of the Past Are Competing for Votes in Poland". The New York Times. Retrieved 15 January 2008. ^ "Poland". Columbia Encyclopedia. Retrieved 29 December 2007. ^ a b c d Snyder 2004, p. 144. ^ a b Zimmerman 2004, p.166. ^ Vital 1999, p. 788. ^ a b Zimmerman 2003, p. 19]. ^ Prizel 1998, p. 61. ^ Wein 1990, p. 292. ^ Cieplinski, Feigue (2002). "Poles and Jews: The Quest For Self-Determination 1919–1934". Binghamton University History Department. Archived from the original on 18 September 2002. ^ Snyder 2007, p. 66. ^ Davies 2005, p. 407 (1982 ed. Columbia Univ. Press). ^ Urbankowski 1997, vol. 2, pp. 330-7. ^ Urbankowski 1997, vol. 1, pp. 538-40. ^ Charaszkiewicz 2000, pp. 56-87. ^ a b c d Urbankowski 1997, vol. 1, pp. 539-40. ^ Kershaw 2001, p. 237. ^ Charaszkiewicz 2000, p. 64. ^ Urbankowski 1997, vol. 2, pp. 317-26. ^ Baliszewski, Dariusz (28 November 2004). "Ostatnia wojna marszałka". Wprost (in Polish). Agencja Wydawniczo-Reklamowa "Wprost" (48/2004, 1148). Retrieved 24 March 2005. ^ Andrzej Garlicki, Józef Piłsudski: 1867–1935, Warsaw, Czytelnik, 1988, ISBN 8307017157, pp. 63–64. ^ Suleja Vladimir, Jozef Pilsudski, Wroclaw - Warsaw - Kraków 2005, ISBN 83-04-04706-3, pp. 290. ^ Drozdowski & Szwankowska 1995, p. 5. ^ Dov Weissberg, I remember, page 116. Google Books. 1 January 1998. ISBN 978-965-294-124-4. Retrieved 24 July 2011. ^ "Interview with Holocaust survivor Cyla Wiener". Holocaust.umd.umich.edu. 13 July 1992. Retrieved 24 July 2011. ^ To, Wireless (26 June 1937). "Crowds urge Poland to banish Archbishop; Pilsudski Legionnaires also Assail Catholic Church on the Removal of Marshal's Body". New York Times. Retrieved 14 December 2009. ^ Lerski 1996, p. 525. ^ Urbankowski 1997, vol. 1, pp. 133-41. ^ Jabłonowski & Stawecki 1998, p. 13. ^ Jabłonowski & Stawecki 1998, p. 5. ^ a b Jabłonowski & Stawecki 1998, p. 14. ^ Drozdowski & Szwankowska 1995, p. 6. ^ Translation of Mościcki's speech from 1935. For Polish original online, see Kobos, Piotr M. (1992). "Skazuję Was Na Wielkość: Legenda Józefa Piłsudskiego". Zwoje (The Scrolls) no. 2 (43) (in Polish). Archived from the original on 22 December 2007. Retrieved 15 January 2008. ^ Władyka 2005, pp. 285–311; Żuławnik, Małgorzata & Mariusz 2005. ^ Translation of Oświadczenie Sejmu Rzeczypospolitej Polskiej z dnia 12 maja 1995 r. w sprawie uczczenia 60 rocznicy śmierci Marszałka Józefa Piłsudskiego. (M.P. z dnia 24 maja 1995 r.). For Polish original online, see here . ^ "Polish Armoured Train Nr. 51 ("I Marszałek")". PIBWL (Prywatny Instytut Badawczy Wojsk Lądowych). Retrieved 30 May 2006. ^ "Kopiec Józefa Piłsudskiego". Pedagogical University of Kraków (in Polish). Archived from the original on 7 July 2007. Retrieved 18 September 2007. ^ "Józef Piłsudski Institute of America Welcome Page". Józef Piłsudski Institute of America. Archived from the original on 15 June 2006. Retrieved 26 May 2006. ^ "Józef Piłsudski Academy of Physical Education in Warsaw". Polish Ministry of Education and Science. Archived from the original on 23 September 2005. Retrieved 30 May 2006. ^ "Piłsudski (keyword)". National Library Of Poland. Retrieved 15 January 2008. ^ "Library of Congress Online Catalog". Retrieved 20 December 2007. ^ ""Marszalek Pilsudski" (2001, mini)". IMDb. Retrieved 30 May 2006. ^ Lachowicz, Teofil. Karkowska, Julita (ed.). "Droga na szczyty". Nowy Dziennik (in Polish). Archived from the original on 23 July 2011. Retrieved 24 July 2011. Alabrudzińska, Elżbieta (1999). Kościoły ewangelickie na Kresach Wschodnich II Rzeczypospolitej (in Polish). Toruń: The Nicolaus Copernicus University Press. ISBN 978-83-231-1087-3. Biskupski, Mieczysław B. (2000). The History of Poland. Westport, CT: Greenwood Press. ISBN 978-0-313-30571-9. Biskupski, Mieczysław B. (2012). Independence Day: Myth, Symbol, and the Creation of Modern Poland. Oxford University Press. ISBN 9780199658817. Blobaum, Robert (1984). Feliks Dzierzynsky and the SDKPiL: A study of the origins of Polish Communism. ISBN 978-0-88033-046-6. Boemeke, Manfred F.; Feldman, Gerald D.; Glaser, Elisabeth (1998). The Treaty of Versailles: A Reassessment After 75 Years. Cambridge University Press. ISBN 978-0-521-62132-8. Charaszkiewicz, Edmund (2000). Grzywacz, Andrzej; Kwiecień, Marcin; Mazur, Grzegorz (eds.). Zbiór dokumentów ppłk. Edmunda Charaszkiewicza [A Collection of Documents by Lt. Col. Edmund Charaszkiewicz] (in Polish). Kraków: Fundacja Centrum Dokumentacji Czynu Niepodległościowego—Księgarnia Akademicka. ISBN 978-83-7188-449-8. Cienciala, Anna M. (2002). "The Rebirth of Poland (lecture notes)". Retrieved 2 June 2006. Cienciala, Anna M. (2011). "The Foreign Policy of Józef Pi£sudski and Józef Beck, 1926–1939: Misconceptions and Interpretations". The Polish Review. 56 (1/2): 111–51. JSTOR 41549951. Cisek, Janusz (2002). Kościuszko, We Are Here: American Pilots of the Kościuszko Squadron in Defense of Poland, 1919–1921. Jefferson, NC: McFarland. ISBN 978-0-7864-1240-2. Cohen, Stephen F. (1980). Bukharin and the Bolshevik Revolution: A Political Biography, 1888–1938. Oxford University Press. ISBN 978-0-19-502697-9. Davies, Norman (2003) . White Eagle, Red Star: The Polish-Soviet War, 1919–1920. London: Pimlico. ISBN 9780712606943. Davies, Norman (2005) . God's Playground: A History of Poland. Vol. 2 - 1795 to the Present. Oxford University Press. ISBN 978-0-19-925340-1. Davies, Norman (1986) . Heart of Europe: A Short History of Poland. Oxford University Press. ISBN 978-0-19-285152-9. Drozdowski, Marian Marek; Szwankowska, Hanna (1995). "Przedmowa". Pożegnanie Marszałka: Antologia tekstów historycznych i literackich (in Polish). Warsaw: Towarzystwo Miłośników Historii—Komisja Badań Dziejów Warszawy Instytutu Historii PAN: Oficyna Wydawnicza "Typografika". ISBN 978-83-86417-18-6. Engelking, Barbara (2001). Paulsson, Gunnar S. (ed.). Holocaust and Memory: The Experience of the Holocaust and Its Consequences: an Investigation Based on Personal Narratives. Translated by Harris, Emma. Leicester University Press. ISBN 978-0-7185-0159-4. Erickson, John (2001). The Soviet High Command: A Military-Political History, 1918–1941 (3rd ed.). Portland, OR: Frank Cass. ISBN 978-0-7146-5178-1. Flannery, Edward H. (2005). The Anguish of the Jews: Twenty-Three Centuries of Antisemitism. Mahwah NJ: Paulist Press. ISBN 978-0-8091-4324-5. Garlicki, Andrzej (1995). Józef Piłsudski - 1867–1935. Routledge. ISBN 978-1-85928-018-8. Goldstein, Erik (2002). The First World War Peace Settlements, 1919–1925. London; New York City: Longman. ISBN 978-0-582-31145-9. Hehn, Paul N. (2005). A Low Dishonest Decade: The Great Powers, Eastern Europe, and the Economic Origins of World War II, 1930–1941. Continuum. ISBN 978-0-8264-1761-9. Hetherington, Peter (2012). Unvanquished: Joseph Pilsudski, Resurrected Poland, and the Struggle for Eastern Europe. Houston Tx: Pingora Press. ISBN 978-0-9836563-1-9. Hyde-Price, Adrian (2001). Germany and European Order. Manchester University Press. ISBN 978-0-7190-5428-0. Jabłonowski, Marek; Stawecki, Piotr (1998). Następca komendanta. Edward Śmigły-Rydz. Materiały do biografii (in Polish). Pułtusk: Wyższa Szkoła Humanistyczna w Pułtusku. ISBN 978-83-909208-0-1. Jabłonowski, Marek; Kossewska, Elżbieta, eds. (2005). Piłsudski na łamach i w opiniach prasy polskiej 1918–1989 [Piłsudski as Seen in the Polish Press, 1918–1989] (in Polish). Warsaw: Oficyna Wydawnicza ASPRA–JR and Warsaw University. ISBN 978-83-89964-44-1. Jędrzejewicz, Wacław (1990) . Pilsudski: A Life For Poland. New York City: Hippocrene Books. ISBN 978-0-87052-747-0. Jędrzejewicz, Wacław; Cisek, Janusz (1994). Kalendarium Życia Józefa Piłsudskiego (in Polish). Wrocław: Zakład Narodowy im. Ossolińskich. ISBN 978-83-04-04114-1. Jordan, Nicole (2002). The Popular Front and Central Europe: The Dilemmas of French Impotence 1918–1940. Cambridge University Press. ISBN 978-0-521-52242-7. Kenez, Peter (1999). A History of the Soviet Union from the Beginning to the End. Cambridge University Press. ISBN 978-0-521-31198-4. Kershaw, Ian (2001). Hitler, 1936–1945: Nemesis. New York City: W. W. Norton. ISBN 978-0-393-32252-1. Kipp, Jacob, ed. (1993). Central European Security Concerns: Bridge, Buffer, Or Barrier?. Portland OR: F. Cass. ISBN 978-0-7146-4545-2. Lerski, Jerzy Jan (1996). Historical Dictionary of Poland, 966–1945. Editing and emendations by Piotr Wróbel and Richard J. Kozicki. Westport, Conn.: Greenwood Press. ISBN 978-0-313-26007-0. Leslie, R. F. (1983). The History of Poland Since 1863. Cambridge University Press. ISBN 978-0-521-27501-9. Lönnroth, Erik; Björk, Ragnar; Molin, Karl (1994). Conceptions of National History: Proceedings of Nobel Symposium 78. Berlin; New York City: Walter de Gruyter. ISBN 978-3-11-013504-6. Lukacs, John (2001). The Last European War: September 1939 – December 1941. Yale University Press. ISBN 978-0-300-08915-8. MacMillan, Margaret (2003). Paris 1919: Six Months That Changed the World (Random House trade paperback ed.). New York: Random House Trade Paperbacks. ISBN 978-0-375-76052-5. Payne, Stanley G. (1995). A History of Fascism, 1914–1945. University of Wisconsin Press. ISBN 978-0-299-14874-4. Piłsudski, Józef (1989). Urbankowski, Bohdan (ed.). Myśli, mowy i rozkazy (in Polish). Warsaw: Kwadryga. ISBN 978-83-85082-01-9. Pipes, Richard (1993). Russia under the Bolshevik Regime. New York City: Knopf. ISBN 978-0-394-50242-7. Pobóg-Malinowski, Władysław (1990). 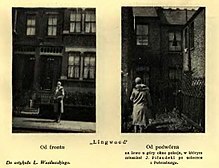 Najnowsza historia polityczna Polski 1864–1945 (in Polish). Warsaw: Krajowa Agencja Wydawnicza. ISBN 978-83-03-03163-1. Prizel, Ilya (1998). National Identity and Foreign Policy: Nationalism and Leadership in Poland, Russia and Ukraine. Cambridge University Press. ISBN 978-0-521-57697-0. Rąkowski, Grzegorz (2005). Wołyń: przewodnik krajoznawczo-historyczny po Ukrainie Zachodniej. Rewasz. ISBN 83-89188-32-5. Roos, Hans (1966). A History of Modern Poland, from the Foundation of the State in the First World War to the Present Day. Translated by J.R. Foster from the German Geschichte der polnischen Nation, 1916–1960. (1st American ed.). New York: Knopf. OCLC 396836. Roszkowski, Wojciech (1992). Historia Polski 1914–1991 (in Polish). Warsaw: Wydawnictwo Naukowe PWN. ISBN 978-83-01-11014-7. Sanford, George (2002). Democratic Government in Poland: Constitutional Politics Since 1989. New York City: Palgrave Macmillan. ISBN 978-0-333-77475-5. Snyder, Timothy (2004). The Reconstruction of Nations: Poland, Ukraine, Lithuania, Belarus, 1569–1999. Yale University Press. ISBN 978-0-300-10586-5. Snyder, Timothy (2007). Sketches from a Secret Warr: A Polish Artist's Mission to Liberate Soviet Ukraine. Yale University Press. ISBN 978-030012599-3. Stachura, Peter D. (2004). Poland, 1918–1945: An Interpretive and Documentary History of the Second Republic. Routledge. ISBN 978-0-415-34358-9. Suleja, Włodzimierz (2004). Józef Piłsudski (in Polish). Wrocław: Zakład Narodowy im. Ossolińskich. ISBN 978-83-04-04706-8. Urbankowski, Bohdan (1997). Józef Piłsudski: Marzyciel i strateg [Józef Piłsudski: Dreamer and Strategist] (in Polish). 1–2. Warsaw: Wydawnictwo ALFA. ISBN 978-83-7001-914-3. Vital, David (1999). A People Apart: The Jews in Europe, 1789–1939. Oxford University Press. ISBN 978-0-19-821980-4. Wandycz, Piotr S. (1990). "Poland's Place in Europe in the Concepts of Piłsudski and Dmowski". East European Politics & Societies. 4 (3): 451–68. Watt, Richard M. (1979). Bitter Glory. New York City: Simon and Schuster. ISBN 978-0-671-22625-1. Wein, Berel (1990). Triumph of Survival: The Story of the Jews in the Modern Era 1650–1990. Shaar / Mesorah. ISBN 0-89906-498-1-. Władyka, Władysław (2005). Z Drugą Rzeczpospolitą na plecach. Postać Józefa Piłsudskiego w prasie i propagandzie PRL do 1980 roku. In Jabłonowski & Kossewska 2005. Zimmerman, Joshua D. (2003). Contested Memories: Poles and Jews During the Holocaust and Its Aftermath. Rutgers University Press. ISBN 978-0-8135-3158-8. Zimmerman, Joshua D. (2004). Poles, Jews, and the Politics of Nationality: The Bund and the Polish Socialist Party in Late Tsarist Russia, 1892–1914. University of Wisconsin Press. ISBN 978-0-299-19464-2. Żuławnik, Małgorzata; Żuławnik, Mariusz (2005). Powrót na łamy. Józef Piłsudski w prasie oficjalnej i podziemnej 1980–1989 [Return to the Newspapers: Józef Piłsudski in the Official and Underground Press, 1980–1989]. In Jabłonowski & Kossewska 2005. This is only a small selection. See also National Library in Warsaw lists. Czubiński, Antoni, ed. (1988). Józef Piłsudski i jego legenda [Józef Piłsudski and His Legend]. Warsaw: Państowe Wydawnictwo Naukowe PWN. ISBN 978-83-01-07819-5. Garlicki, Andrzej (1981). "Piłsudski, Józef Klemens". Polish Biographical Dictionary (Polski Słownik Biograficzny) vol. XXVI (in Polish). Wrocław: Polska Akademia Nauk. pp. 311–324. Hauser, Przemysław (1992). Dorosz, Janina (transl.). "Józef Piłsudski's Views on the Territorial Shape of the Polish State and His Endeavours to Put them into Effect, 1918–1921". Polish Western Affairs. Poznań: Komisja Naukowa Zachodniej Agencji Prasowej (2): 235–249. ISSN 0032-3039. Wandycz, Piotr S. (1970). "Polish Federalism 1919–1920 and its Historical Antecedents". East European Quarterly. Boulder, Colorado. 4 (1): 25–39. ISSN 0012-8449. Wikimedia Commons has media related to Józef Piłsudski.